This morning I had just enough time to repack everything, quickly devour some breakfast, and catch up on writing. Despite ditching my umbrella and having used up some bathroom supplies, my bag is still incredibly full and heavy. Go figure! I made sure to carve 10 minutes into the timeline of making the ferry schedule to grab a much needed cappuccino. I do miss the bakeries and inexpensive coffee of Riga…awe…we can’t be spoiled forever right. The bus was about 15 minute walk from the hotel and even with the sun out, my hands froze in the chill of the shadows. A gloves day for sure. I’m so accustomed to Google Maps steering me successfully all around the world that I have to chuckle if we rewind 20 years ago, us ‘introverted-thinking’ types would have been forced to exhibit ‘extroverted-feeling’ attributes of leveraging people for information. Oh my! It’s funny I have so many Myer’s Brigg’s ExFx in my life they’re always saying ‘oh just ask the front desk, that’s what I do!’. But an IxTx is considering the quality of information, the percent chance of misinformation against the reliability of Google Maps, as well as the length of time required to get the information, and it becomes a no-brainer to us, the three seconds on Google wins. Fun how we’re all so different! The ferry ticket said the latest check in was 90 minutes early. Wowzer! As a rule follower, I of course complied, grumpily as it seemed inefficient. Though once at the terminal I suspect it was probably a translation issue as people checked in up until 30 minutes prior. Oh well. Gave me time to finish uploading yesterday’s photos! One of the things that continues to surprise me is how I’ve glided through Poland, Lithuania, Latvia, Estonia and now Finland without going through passport control. It’s like I’m off the radar. It sounds weird but there’s something nice about knowing my country can trace my global movements so if something were to go wrong, they would know where to find me. Yes, false sense of security, absolutely, but still feels comforting. As I stepped on the monstrous ferry, I just have to say it is not a ferry by any US definition and I can only image the pure shock when Europeans come to the US and get on our ferries which are typically old, with a little kiosk in the center to buy junk food, and chairs that resemble a sporting event. These European ferries, well, we would classify them as cruise ships. Decks 1, 2, and 3 were for cars. Decks 4 and 5 were sleeping quarters, which as an INTJ on an enormous ship surrounded by people, as if trapped in Times Square for 3 hours, if there was a way to pay for that solitude you better believe I would have. Decks 6 and 7 is where we were stuck – the bars, restaurants, arcades, shopping stores, and roof top. In my true introverted fashion, I hunkered into the corner of a somewhat unknown balcony at one of the restaurants, grabbed a glass of wine, and pretended the swarm of people didn’t exist! As the ferry pulled into port, small islands like seen around Maine came into view, with adorable little houses nestled on them. How tranquil. The hotel was around 20 minute walk from the boat dock and by the time I reached it my pack was started to feel like a bag of bricks. The hotel is in a gorgeous historic building with cathedral like ceilings. Compact rooms like found on a cruise ship or in Tokyo, but I enjoy the modern look and efficient use of space. The town center was around 15 minutes walk, the furthest I’ve been from a town center since I started the journey. It’s certainly a port city with the water lining the old town and its cobblestone roads and towering cathedrals shimmering with gold in the light of the sun. Many of the buildings are large and stately, rather uniform in size and somewhat British looking. 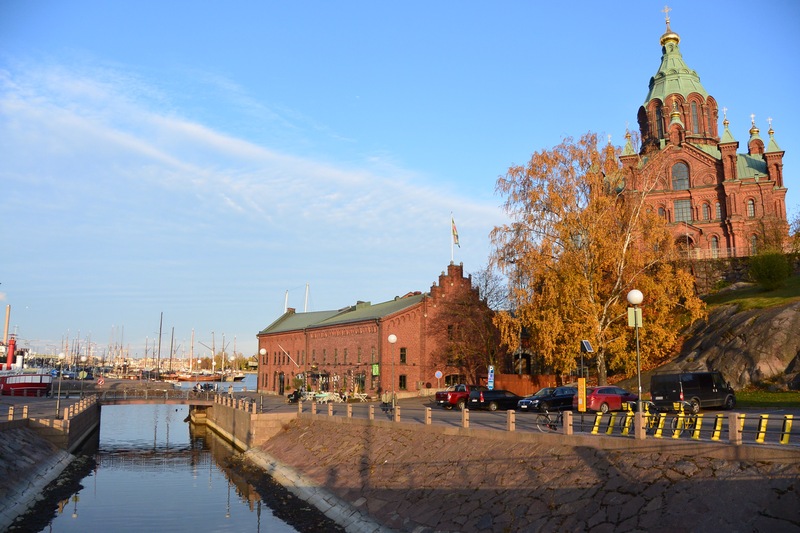 Unlike the last few cities I’ve visited, Helsinki’s key sights appear a bit more spread out. I guess tomorrow I will learn the public transit options! The night fall came later than I had expected, I was thinking being this far north dark would come early but it was still light-ish at 630pm. Maybe it was the Baltic Sea voyage today, but I was craving fresh, raw fish. Sushi time! Michelin recommended Yumi and I’d definitely agree. I elected to do their Yumi tasting menu to get the best of the experience. The starter included two pieces of white fish nigiri style, salmon sashimi, and tempura vegetables. Delightful. The main dish was strips of steak dipped individually with chop sticks into a thick soy-like sauce along side the best sticky rice I’ve had outside Japan. The table next to me was clearly from oil and gas. Given the references to London and Houston I’m guessing they worked for BP. It was nice, it was three men and they were talking about how hard it is to be away from their wives, how they consider them always, how they wish they could do more to make all their travels easier on them. The whole time I was thinking, that’s my kind of guy. In NY he’d be viewed as a tool, a chump, but outside of NY he’s viewed as a strong family man, my kind of man. It’s funny, I was reading a blog about solo travel and how there are four monsters that always creep in – loneliness, unmet expectations, selfies, and envy. Not really being able to relate to any of those, it made me realize how different solo travel is based on your Myer’s Brigg’s. My guess given the woman’s four areas is that she’s an ExFx, which is a very common female Myer’s Brigg’s type. I’m gathering that by lonely and selfies (those are more of ‘E’ traits) and envy and unmet expectations (those are more ‘F’ traits). Being an I (not E) and T (not F), her ‘monsters’ don’t really resonate, though it did make me think what would be my travel pains. I had to think quite hard actually as solo travel for me is an incredibly lovely experience, though if I had to pick one thing that luckily doesn’t come up often it would be the ‘invisible’ factor. Normally I adore being invisible, it’s my favorite and well practiced skill. However, when in a line waiting for something or trying to get into a restaurant or anything else where you can easily be trampled or overrun by others, invisible is an annoying and frustrating place to be. Luckily INTJs don’t have the people pleaser gene so we’re okay with the confrontation of holding our place in line, but really, we don’t enjoy having to do it at all. That’s really the only thing that is difficult. At least for me. Thinking about the article it did make me wonder how 13 days in, I’ve yet to feel lonely. Wondering what makes a person feel lonely versus other people who are content with solitude. Also what does homesick feel like, I’ve heard the word, but what’s the emotion behind it. I also realized I’ve only taken one selfie, in Estonia, as I felt after a couple weeks I should at least have one photo that proves I was physically here. I literally took one shot that I spent 2 seconds on. It’s not that I don’t like how I look, I’m fine, I look just as human as everyone else, it’s more that (a) it never comes to mind and (b) it feels ridiculous (and vain?) to point a camera at myself. I’m much more of a fan of those ‘not really looking’ photos that your significant other takes while traveling. However, I tend to date the guys that don’t take photos, so it’s usually just me having a library of awesome ‘not really looking’ photos of them and I once again become invisible on my travel excursions. Kind of funny. Well that was a fun mental excursion! Anyhow, for dessert it was one of their signatures, a peanut butter Grenache. Smooth and rich and covered in berries. It was the perfect end to the meal. I wandered back to the hotel feeling blissful and happy at yet another awesome day of travel. Feeling blessed to be having this and hoping there’s at least one person gaining value from all these travel stories! So as with every night, my goal was to stay up late (by late I mean 10 or 10:30p – ha!) so I could get in a good rhythm in time for the northern lights, but alas, I’m lousy at night no matter how hard I try. Tonight was once again a fail. Maybe tomorrow! Thank You for this post. Many of my readers have told to me that sceneries in Maine and Finland are quite similar. Thanks Matti from Finland! You have a beautiful country. Next stop Lapland! I can’t wait. Wow. I am very glad that You will visit to our Lapland. Arctic Circle is must. More on my site.